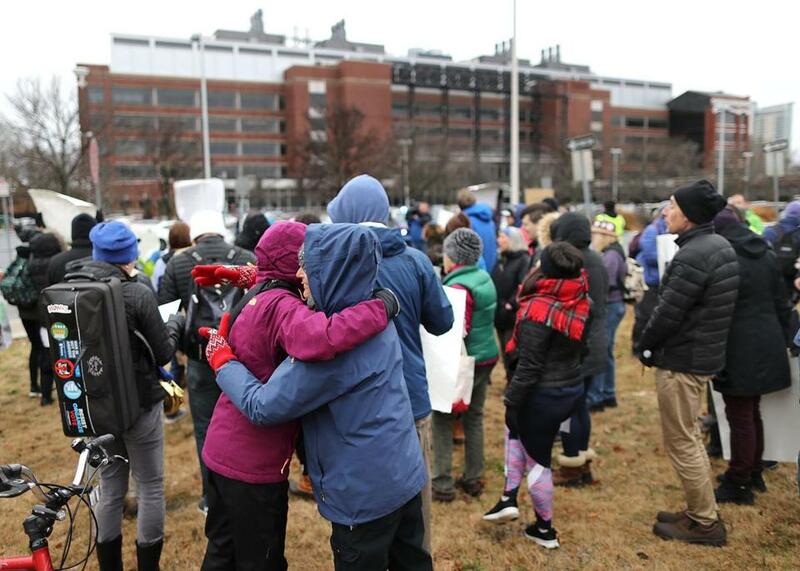 Protesters gathered in front of Sanofi in Cambridge on Friday. 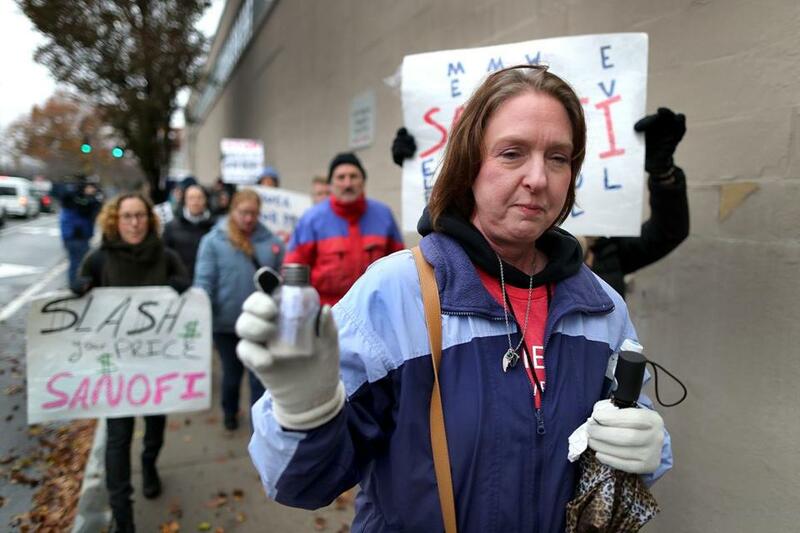 Two mothers Friday tried to deliver the ashes of their two diabetic children to the Cambridge offices of drug giant Sanofi to protest the high price of insulin, which the company manufactures. The women said their adult children died while rationing the drug to save money, after losing their health insurance. 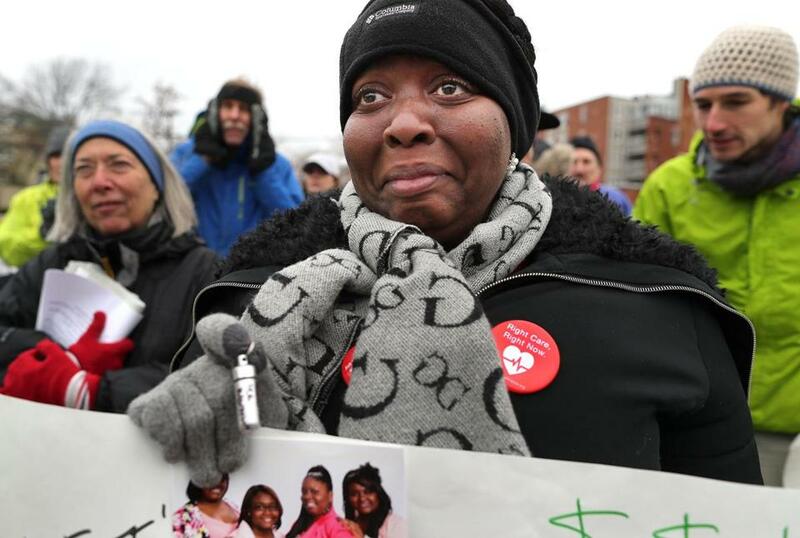 Antroinette Worsham of Cincinnati, Ohio, and Nicole Smith-Holt from Richfield, Minn., were joined by about 75 protesters. 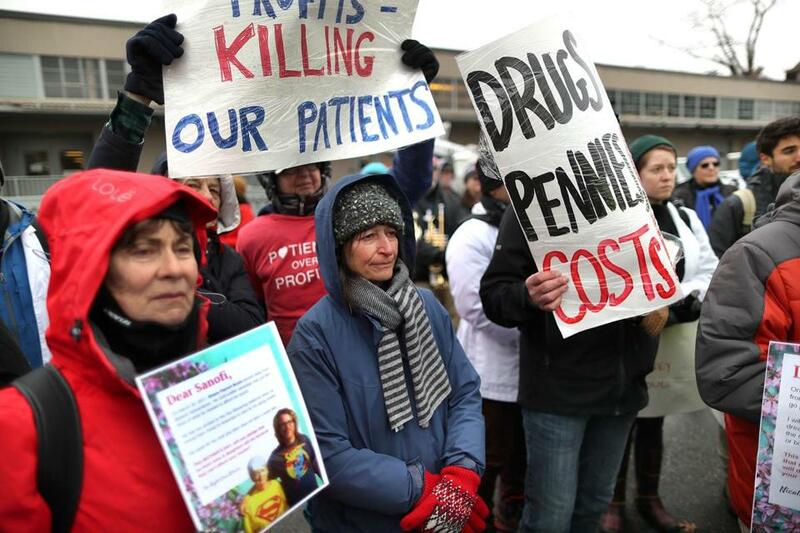 According to the Brookline-based Right Care Alliance, a patient advocacy coalition that organized the protest, Paris-based Sanofi is one of three insulin manufacturers that in recent years have marked up prices by as much as 5,000 percent. About 75 protesters gathered outside of Sanofi in Cambridge. The protesters stayed across the street while the two mothers attempted to walk through the Memorial Drive parking lot with small containers holding the ashes, but company security officials ordered them off the property, said Aaron Toleos, a spokesman for Right Care. Toleos said police on the scene told the women that “if you choose not to leave, you will be arrested.” No arrests were made. “We continued with the protest and letting them know the price of their product is killing people when it’s intended to save their lives,” said Smith-Holt, whose 26-year-old son, Alec Raeshawn Smith, died last year. Nicole Smith-Holt of Richfield, Minn., held a vial with the ashes of her son, Alec, who died at the age of 26 from insulin rationing. Worsham’s daughter, Antavia Lee Worsham, 22, also died in 2017. Right Care said they, and one other diabetes patient, lost their lives because they were forced to cut back on their medication to save money. Antroinette Worsham held a vial of ashes from her daughter, Antavia Lee Worsham, who died last year. Nicolas Kressmann, a spokesman for Sanofi, said the company is exploring innovative ways to reduce out-of-pocket costs for patients. He said the company’s security prevented the protesters from entering the company’s office because of safety concerns. “We want to ensure everything works as well as possible for employees and the protesters. We don’t want any accidents or any situation,” he said.